Background: The extracellular environment plays an important role in supporting the regeneration of axons after injury. Metallothionein-II (MTII) is a metal-binding protein known for its neuroprotective effect by directly stimulating the growth of axons after injury. Previous studies have shown that MTII also modulates the response of astrocytes and microglia after injury. However, a detailed analysis describing how MTII modulates the interaction between microglia and neurons is lacking. Methods: We introduced fluorescently labelled MTII into the cortex at the time of needlestick injury to investigate the cellular uptake of MTII using immunohistochemistry with antibodies against cell-type-specific markers. The role of MTII in modulating the effect of microglia on axon outgrowth following an inflammatory response is further investigated using a co-culture model involving primary rodent microglia pre-treated with TNFα and primary rodent cortical neurons. The axon lengths were assessed 24 h after the plating of the neurons onto treated microglia. We also utilised siRNA to knockdown the expression of LRP1, which allows us to investigate the role of LRP1 receptors in the MTII-mediated effect of microglia on axon outgrowth. Results: Fluorescently labelled MTII was found to be associated with neurons, astrocytes and microglia following injury in vivo. Microglia-neuron co-culture experiments demonstrated that exogenous MTII altered the response of microglia to TNFα. 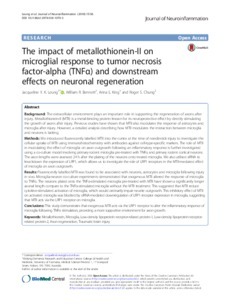 The neurons plated onto the TNFα-stimulated microglia pre-treated with MTII have shown a significantly longer axonal length compare to the TNFα-stimulated microglia without the MTII treatment. This suggested that MTII reduce cytokine-stimulated activation of microglia, which would ordinarily impair neurite outgrowth. This inhibitory effect of MTII on activated microglia was blocked by siRNA-mediated downregulation of LRP1 receptor expression in microglia, suggesting that MTII acts via the LRP1 receptor on microglia. Conclusions: This study demonstrates that exogenous MTII acts via the LRP1 receptor to alter the inflammatory response of microglia following TNFα stimulation, providing a more supportive environment for axon growth.